« Is Social Media Killing Your Productivity & Earning Potential? Back when I was a newspaperwoman, the calls, emails and letters from public relations folks touting their products for Christmas gift-giving began in July. Many times, they would send the product itself, which led to me collecting a lot of random stuff. Jigsaw puzzles, books, travel guides, wrapping paper, even a Build-a-Bear with a recordable voice chip. My favorite by far: YakTrax. 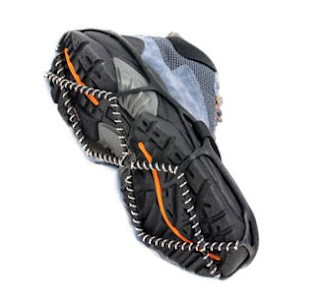 It’s a traction device that slips over the sole of your shoe to keep you from slipping on snow and ice in the winter. Maybe the product is more useful for someone in an area that receives a lot of snow, like Colorado or Vermont, but I had no need for it. Most days, I can handle walking from the front door to the car in inclement weather. I guess they were really trying to market the thing. Seems like they’ve found a niche, since there’s even a YakTrax website. It’s just something I would never give as a present. I rate it up there with other unwanted Christmas gifts, like that knitted turtleneck you got from Aunt Sue or the regifted vacuum-bag sealer. A brown wallet gifted to a grandpa — then given back as a gift the next year. What was the worst Christmas gift you ever received?